In an attempt to take a walk on our vacation in Florida we were shocked to see these signs. This sign clearly demonstrates the ignorance of the law and is making it nearly impossible for disabled people to simply take a walk. 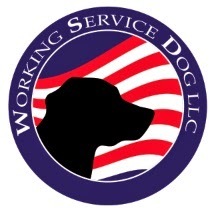 Our number one phone question received at Working Service Dog is "What type of equipment is required for our Service Dog?" Our standard answer is "According to the A.D.A. 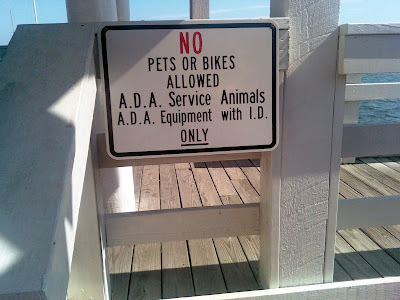 you are not required to carry any specific equipment and that includes Service Dog ID Badges." If that is the case then why would there be signs like the one above, why would they ask for Service Dog ID when we check in at the airport, why do they require a Service Dog Vest at hotels? The answer is that not everyone including state and local authorities know the laws which pertain to Service Dogs. So although no equipment is required, some equipment is necessary if you want to get through your day with as little hassle as possible. By the way, these signs are hanging at the Bridge Street Pier in Bradenton, Florida. Authorities were contacted and they said that they thought the sign was accurately written. When informed otherwise and directed to the A.D.A. website they said that the signs would be removed. It has been 2 months and I am unhappy to inform you that the signs are still hanging up and down the pier.